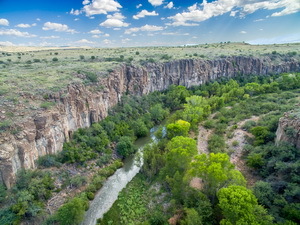 Our Vision is: "Connecting people and resources to promote a healthy, flowing Verde River and a stronger, greater Verde community." Our Mission is:"Provide research and data, funding, policy expertise, education and consulting on diverse Verde River issues." We also help policy makers understand the many complex water resource issues in central Arizona. We are committed to finding sustainable solutions for the human and natural worlds that depend on the Verde River to supply their needs. We are guided by the principle that responses to demands in the system should also increase the river community's intellectual, political, social, individual, natural, built and financial capital. When this goal is realized, the system becomes robust, dynamic and sustainable. Click any chart to enlarge it in a new window. To make a tax-exempt donation supporting the Verde River Institute's Verde River conservation efforts, please click the "donate" button below. The Verde River Institute is a tax-exempt charitable organization under IRS section 501(c)(3).